This article first appeared in The Edge Financial Daily, on May 2, 2018. KUALA LUMPUR: Shareholders holding a majority of shares in Med-Bumikar Mara Sdn Bhd voted in favour of plans to sell a majority stake in MBM Resources Bhd (MBMR) on Monday, setting up a potential clash between the group and its board of directors and other minority shareholders. At the heart of the matter is whether the voting process is valid and if so, whether the voting result is the final say on the matter. Hanging in the air is the possibility that the minority shareholders may turn to legal avenues to contest the extraordinary general meeting’s (EGM) results on the grounds of appropriateness, among others. Also implied from the EGM outcome is that even the majority shareholders are seeking a better offer from UMW as they have told the board to form a task force to negotiate further. The EGM on Monday morning saw shareholders accounting for 52.06% of Med-Bumikar’s shares giving the thumbs up to an offer by UMW Holdings Bhd to buy a 50.07% interest in MBMR for RM501 million, or RM2.56 apiece, “subject to certain requirements and conditions”. However, the remaining shareholders, opposing the proposed transaction, staged a walkout in protest after questioning the EGM’s validity. It is understood that from the majority faction’s perspective, the EGM and the resulting vote are valid as the quorum requirement was met. The dissenting minority were present at the start and only exited midway through the proceedings after registering their protest. The Edge Financial Daily understands the dissenting shareholders view the EGM as inappropriately called because it concerned a matter that had earlier been decided by the board. In early March, UMW offered RM2.56 per MBMR share for Med-Bumikar’s 50.07% stake. The offer was a 16.36% premium to its market value at the time and UMW intends to take MBMR private upon completion of the acquisition. However, Med-Bumikar’s board rejected the offer, saying it undervalued MBMR. Its executive chairman Datuk Abdul Rahim Abdul Halim told The Edge Malaysia weekly that RM3.68, the net tangible asset value of MBMR, was a fairer price. Undeterred, UMW extended the offer deadline by a month to April 30 without raising the offer price. Meanwhile, it is learnt that Majlis Amanah Mara (Mara) had called for Monday’s EGM as it disagreed with the board’s outright rejection of the offer. The majority faction comprises Mara, holding the largest stake in Med-Bumikar at 29%, and the Looi and Wong families. The three parties collectively hold 52.06% of the company. The dissenting minority comprises four other families, with each holding some 11% to 13% stake in Med-Bumikar. The Edge Financial Daily understands that the four families comprise a majority of Med-Bumikar’s board composition. The opposing minds of the majority shareholders and that of Med-Bumikar’s board set up further potential complications. In a statement issued late on Monday evening, Mara said the majority shareholders voting in favour of UMW’s offer want the board to set up a task force committee to negotiate further with UMW. UMW has so far refused to budge on its offer price despite two rejections from Med-Bumikar’s board. This may add pressure on UMW to rethink its offer price. “Moving forward, the decisions of the [majority] shareholders will be communicated to the board for their further action,” Mara stated. “Any decision by Mara pertaining to this matter is strictly guided by the potential strategic benefits brought to Mara as an entity, all Mara’s stakeholders and also to the nation,” it added. It remains to be seen if the Med-Bumikar’s board would carry out the majority shareholders’ wishes in this regard. Last week, the Kuala Lumpur High Court dismissed the minority shareholders’ application seeking an injunction against the EGM. The ultimate prize in UMW Holdings’ takeover bid of MBMR is control over national carmaker Perusahaan Otomobil Kedua Sdn Bhd (Perodua), in which MBMR has a 22.58% stake. UMW already has a 38% block in Perodua and seeks to gain majority control over Perodua by taking over MBMR. If the EGM vote is upheld, it would pave the way for UMW to emerge as Perodua’s majority shareholder. For perspective, no single shareholder has had majority control over Perodua since it was established in the early 1990s. However, a potential snag for UMW later is the right of first refusal for existing Perodua shareholders should any shareholder look to sell. That means Perodua’s Japanese technological partner Daihatsu Motor Co Ltd may be in a position to stop the takeover of Perodua as it has a 30% shareholding in the carmaker. The Edge Malaysia had previously reported that Daihatsu was unhappy over the proposed takeover. The remaining 10% is held by UMW’s majority shareholder Permodalan Nasional Bhd. UMW is separately seeking to buy the 10% block from its parent for RM417.5 million. Last Friday, UMW extended the validity of its offer by six months to Oct 31 from April 30 — the second extension since the offer was announced in early March. The unusually lengthy extension was to “to enable parties to deliberate on the offers”, UMW had announced amid reports that Monday’s EGM was slated to go in its favour. On Monday, Affin Hwang Capital Research reiterated in a research note that UMW’s offer is “unattractive” and that it appears to undervalue Perodua as Malaysia’s leading automotive company. “Should the deal fail to materialise, we believe [the] share price would react negatively for UMW and MBMR,” said Affin Hwang. “For UMW, it would have missed the opportunity to gain control of Perodua at a low price. As for MBMR, we believe the takeover would allow its shareholders to cash out early in a mature auto market,” the research house added. 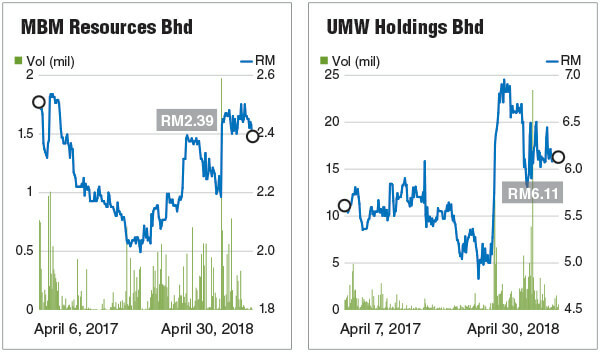 MBMR shares closed unchanged at RM2.39 on Monday, 17 sen lower than UMW’s offer price, with a market capitalisation of RM934.22 million. UMW shares ended the day at RM6.11 per share, down four sen from last Friday’s closing, valuing it at RM7.14 billion.